Kuriology : Cabinet of Curiosities Art and Oddities : You have to love Canadians, Americans & the French...don't you? You have to love Canadians, Americans & the French...don't you? A cursory meander through my blog stats revealed that the vast majority of my visitors are Canadians, followed by USA Americans & from France. Actually, that makes sense as these are the countries which seemingly have the strongest interest in 'Cabinets of Curiosities', Wunderkammer or 'Oddities', as I believe our American cousins like to call them. currently my Kuriology Art is only available to buy to residents in the UK. This is only whilst I find my feet with the selling platforms I am using. Patience, in time I will make Kuriology Art more widely available. But, as if to rub salt into the wound - (I'm mean like that - Bad Kuriologist) Here is some of what was added to the esty Kuriology shop last night. I say 'some', because there were sales this morning. *NO actual hermit crab was harmed in creating of this artifact. Oweer! 'Coco de mer', or as it is sometimes affectionately known the 'love nut' or 'Bum nut'. The oversize nuts are highly prized for, Errr, their suggestive similarity that some see, to that of female genitalia body parts. The over collected species ''Lodoicea maldivica', a type of coconut from around the Indian Ocean has ended up being added to the CITES agreement in the protection of endangered fauna & flora. *NO actual Chambered Nautilus pompilius were harmed in the creating of this artifact. 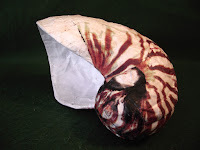 I know.....You really want to get an iconic chambered Nautilus for your oddities, 'Cabinet of Curiosities' collection, but you are aware that the Nautilus is being over fished & is under consideration as being added to the Endangered Species list - dilemma, you are after all an ethical shopper & are concerned about environmental impact!